Before Saleen, before Roush, even before Shelby, a legendary American Ford performance dynasty helped Alan Mann Racing secure the initial professional race win for the Ford Mustang – Holman & Moody. In September 1964, the Alan Mann Racing Team of Great Britain fielded three Mustangs that were specially prepped using engines and performance parts supplied by Holman & Moody in the 4,000 mile long “Tour de France Automobile” rally. Modifications to the 1964 Mustang racecars included bigger and better brakes, an upgraded radiator for extra cooling, a limited slip rear end, a modest horsepower increase, a lowered race-tuned suspension and a free flowing exhaust. 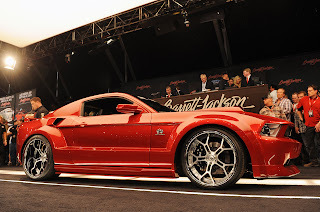 The 2014 Holman & Moody 50th Anniversary TdF Mustang holds true to the original with similar modifications and even the same bright red hue that adorned the 1964 original race cars. Production will be limited to 500 cars to ensure the exclusivity and collectability of each. The “Tour de France Automobile” rally was an automotive endurance race that began in 1899. The event occurred sporadically over 60 years, until becoming an annual race in 1959. At the time, it was the epitome of European motoring, due to safety concerns, it was cancelled in 1986 and replaced with a rally for historic cars that ran at reduced speeds. Holman & Moody was formed when the U.S. automobile manufacturers collectively decided to get out of racing in the late 1950’s. John Holman and Ralph Moody formed the company and became involved with all of Ford’s racing efforts worldwide. In the 1960’s, Holman & Moody became a powerhouse of racing technology as the company’s influence was felt across nearly every sector of automotive competition including NASCAR, road racing and drag racing. Ordering information, pricing and program updates will be available at www.HM50th.com. This entry was written by by MustangsDaily (Mustangs Daily) and posted here on Wednesday, October 31st, 2012 at 5:49 pm and is filed under 2014 holman & moody tdf mustang, holman & moody, holman & moody tdf mustang, News, sema 2012. This article was not written by us, rather gathered using RSS feeds listed here. We take no credit for this article. You can leave a response, or trackback from your own site.